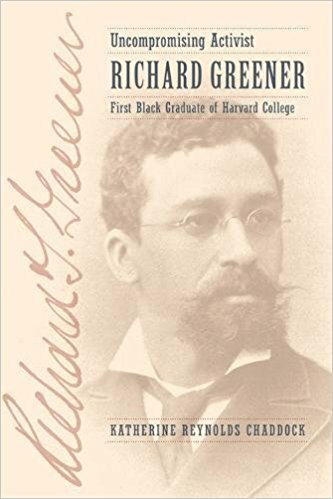 Join us from noon to 1:00 p.m. on Thursday, June 7, 2018, for this month's author talk and book signing: Uncompromising Activist: Richard Greener, First Black Graduate of Harvard College by Dr. Katherine Chaddock. Richard Greener’s story demonstrates the human realities of racial politics in the fight for abolition, the struggle for equal rights, and subsequent backslide into legal segregation. This is the biography of a man who exemplified America’s discomfiting perspectives on race and skin color. Speaker @ the Center is FREE and open to the public; however, we ask that you register to ensure a seat. This program will be held at the South Carolina State Library, 1500 Senate Street, Columbia. Please visit our map & directions page or call (803) 734-8666 for parking information. For more information about Speaker @ the Center, please visit ReadSC.org. Books will be available for purchase and signing. For more information, please contact Andersen Cook, Statewide Initiatives Coordinator at (803)545-4432 or acook@statelibrary.sc.gov.